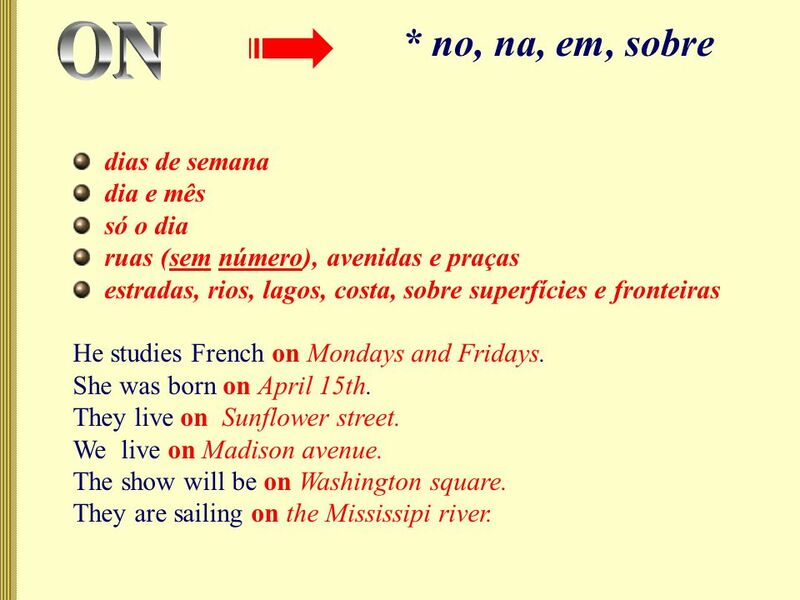 cidades estados países continentes meses estações anos séculos períodos do dia [ morning, afternoon, evening] The TV set is in the box. She lives in. 8 The bird is flying over those trees. 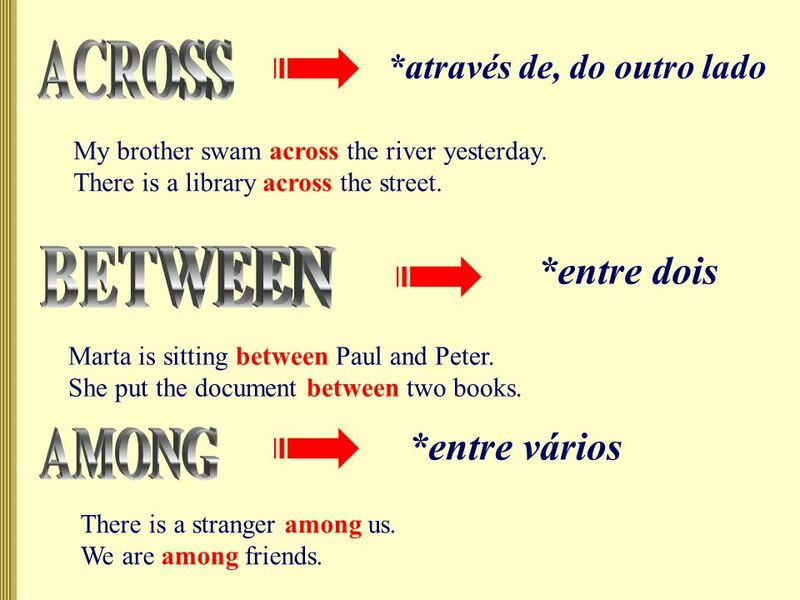 (está voando acima daquelas arvores) The lamp is over that table. 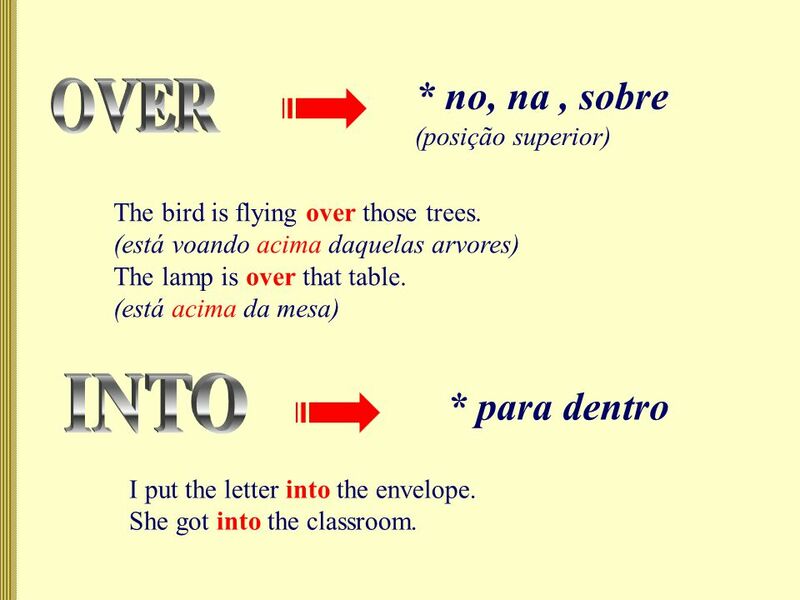 (está acima da mesa) * no, na, sobre (posição superior) * para dentro I put the letter into the envelope. She got into the classroom. 11 *para cima An elevator goes up and down. 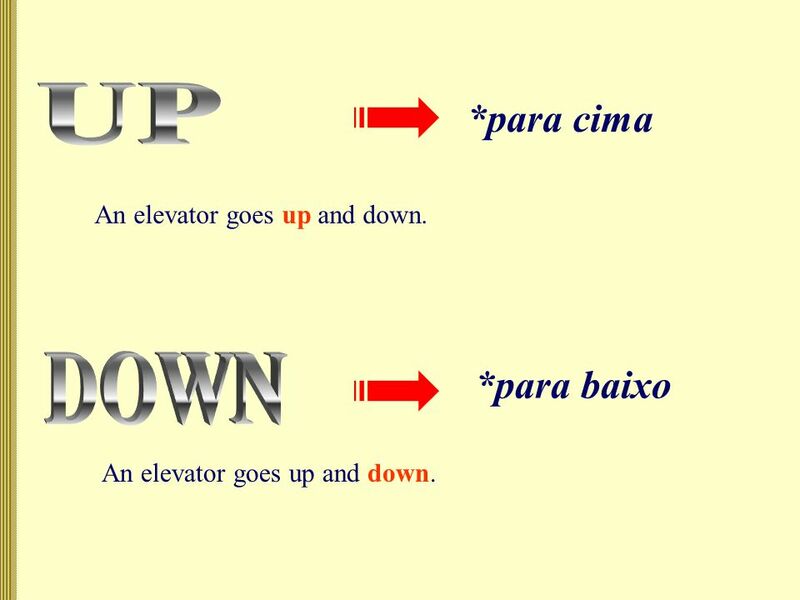 *para baixo An elevator goes up and down. 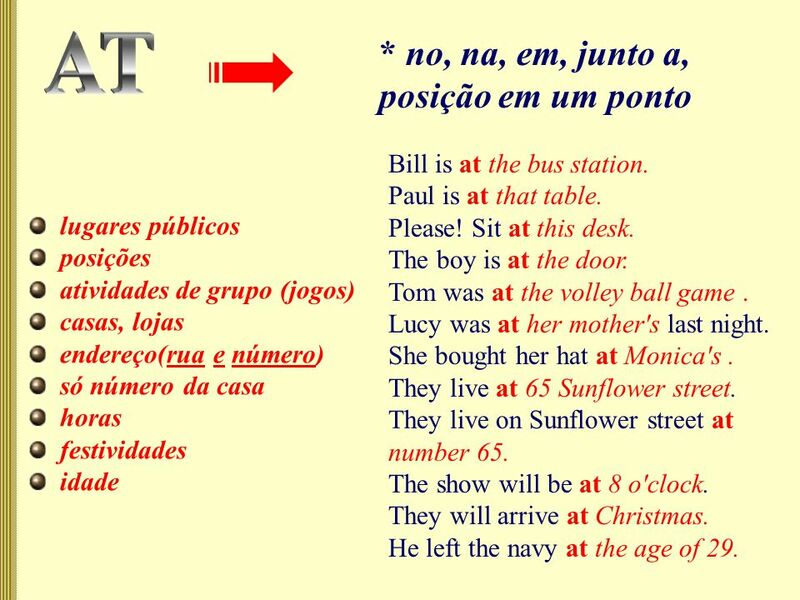 17 * embaixo de The dog is beneath the table. The dog is under the table. 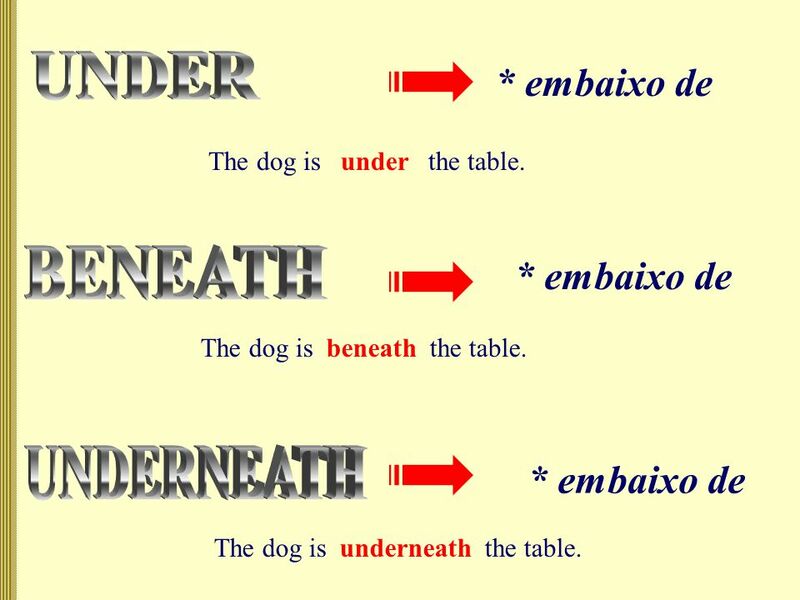 * embaixo de The dog is underneath the table. 18 * com Caroline is with Margaret. A leg of lamb served with potatoes. * fora Her husband was out in Africa. The resort is about twenty miles out of town. * sem A city without history. They drove into town without talking to each other. 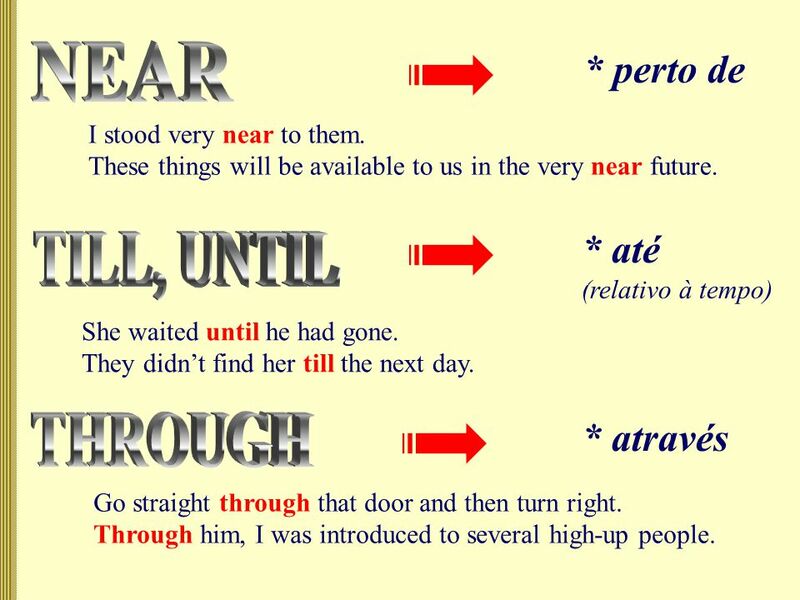 19 * até (relativo à tempo) She waited until he had gone. They didn’t find her till the next day. * através Go straight through that door and then turn right. Through him, I was introduced to several high-up people. ( * perto de I stood very near to them. These things will be available to us in the very near future. 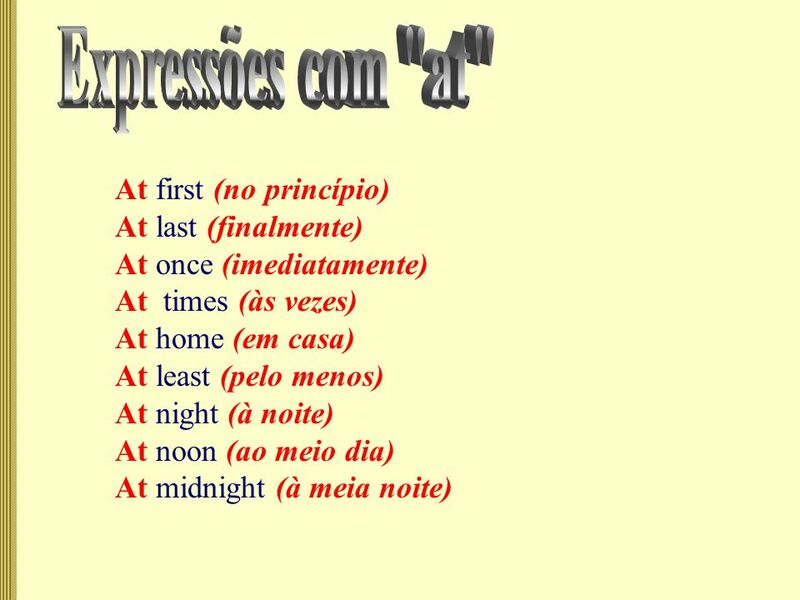 Download ppt "cidades estados países continentes meses estações anos séculos períodos do dia [ morning, afternoon, evening] The TV set is in the box. She lives in." 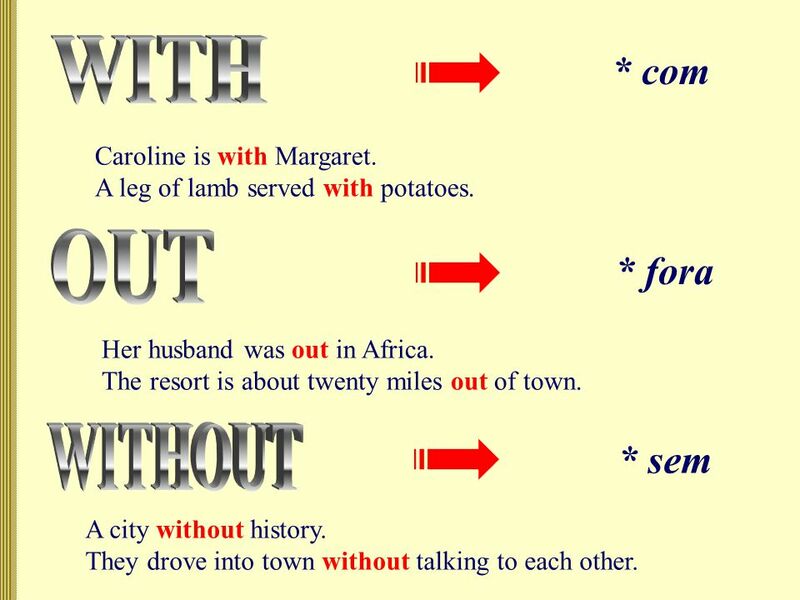 Prepositions II. 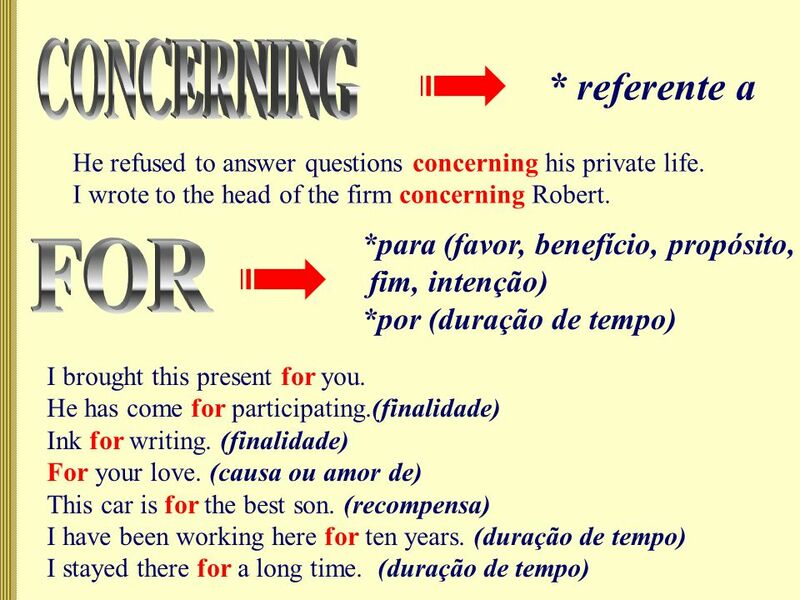 For = para, por, durante, há This is for you! He studied for the test. Ive lived in SB for 10 years. Its not for me to do. My family. Unit 2 Where is the post office ? 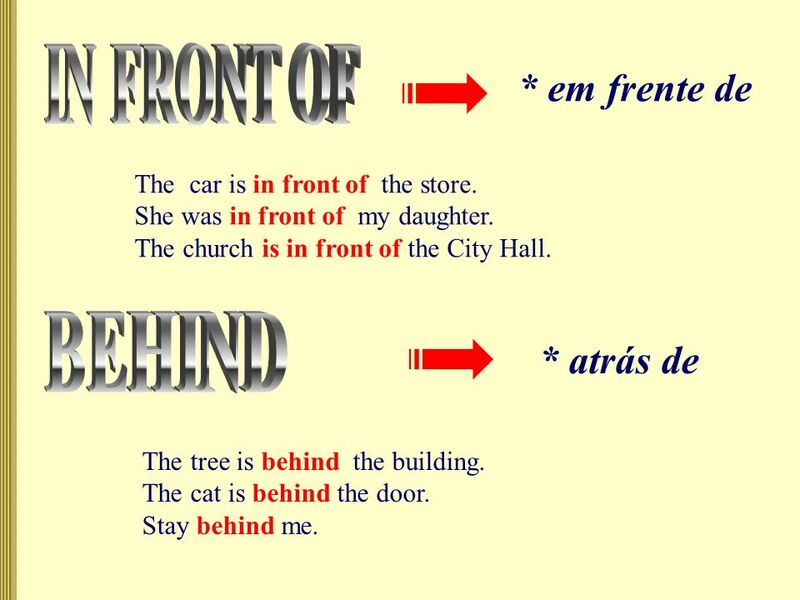 Prepositions. 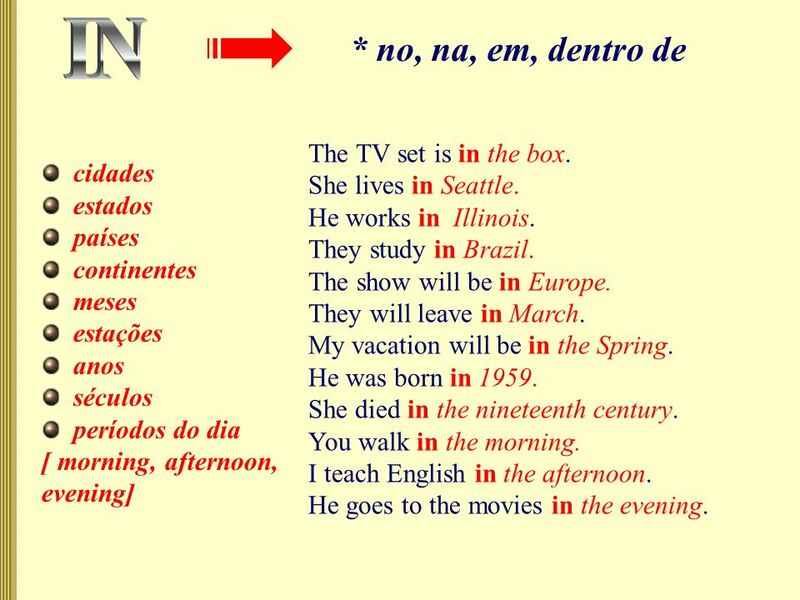 IN = dentro, em, no, na After cities, states, countries and continents. Ex. 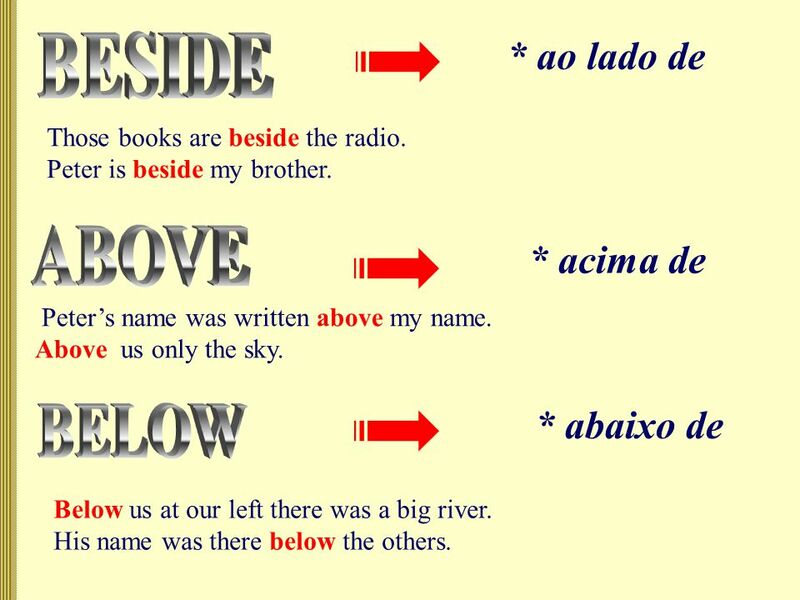 : I live in Brazil. We stopped in/at Curitiba on the way to SP. 89. 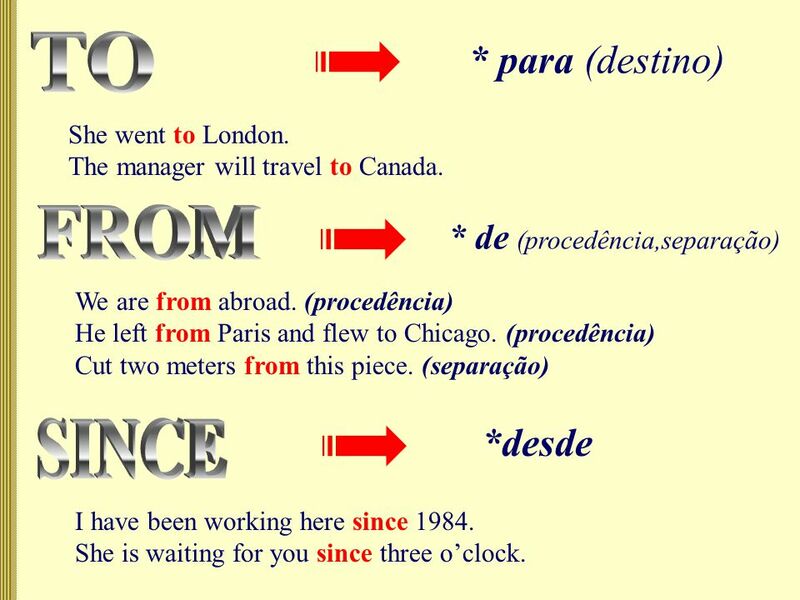 The differences between the past tense and the present perfect tense. 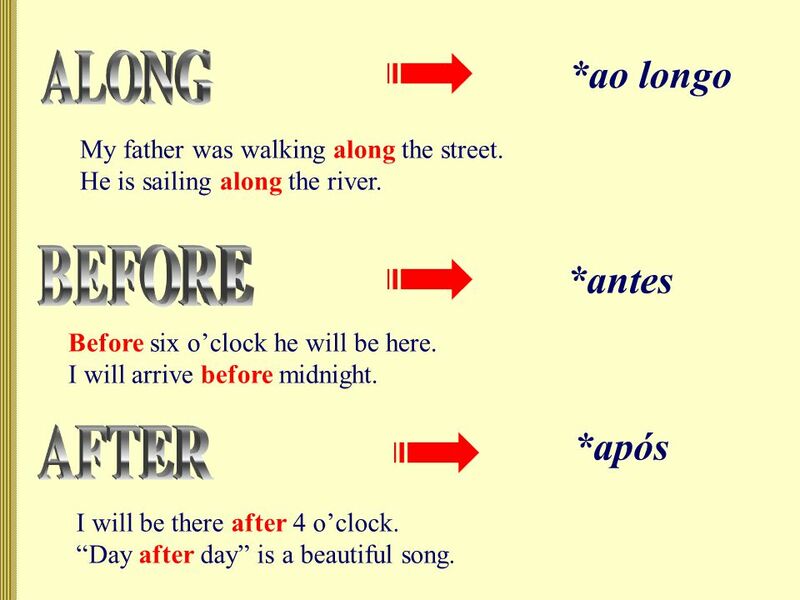 by D. Fisher in on attime inon time month, year, etc. day hour. Welcome Rasel Asst. Teacher Charmugria Girls High School Charmugria, Madaripur. 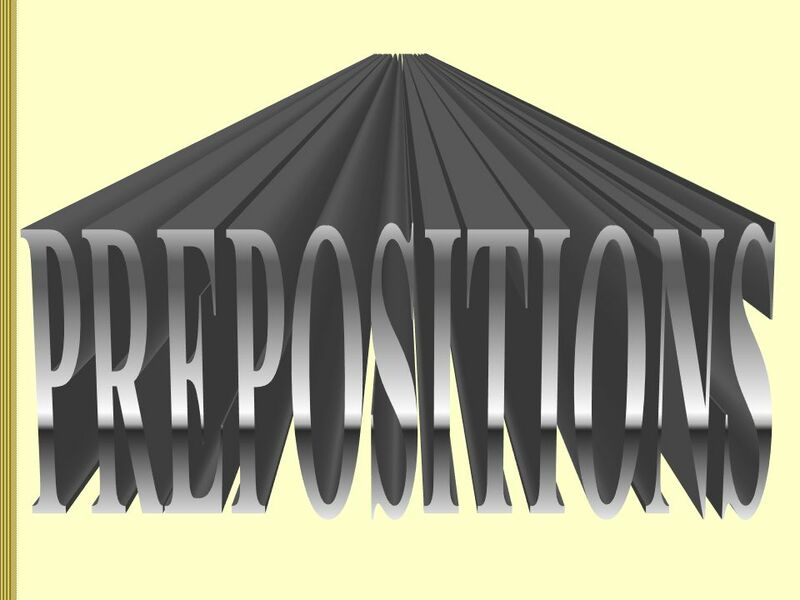 PREPOSITIONS A preposition is a word that relates a noun or pronoun to another word in a sentence. "The dog sat under the tree." 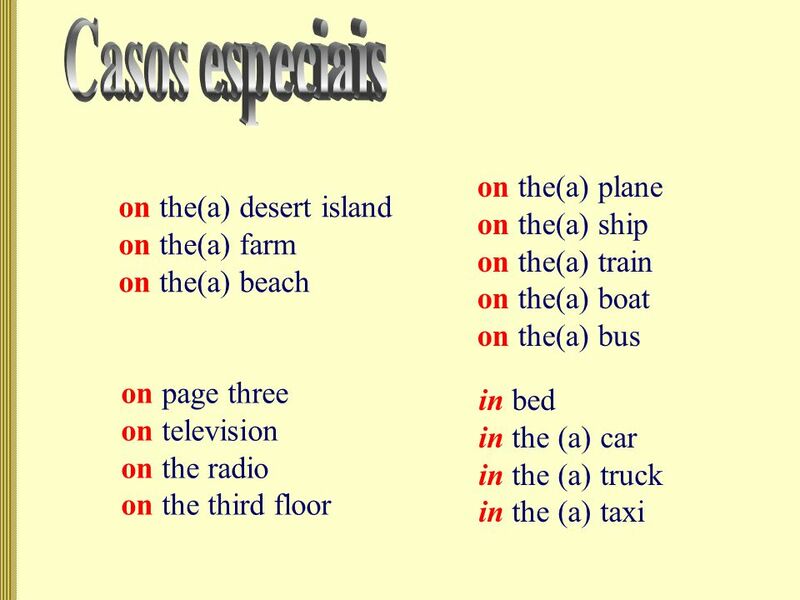 Lessons Prepositions at, in, on (time) at is used: with clock times He came here at 10 oclock. The plane leaves at six. with celebrations, feasts. 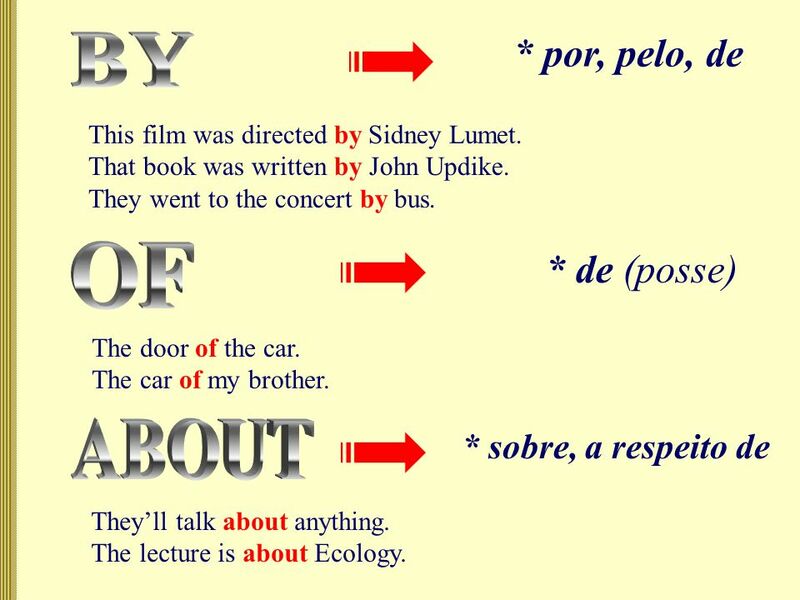 Prepositions. 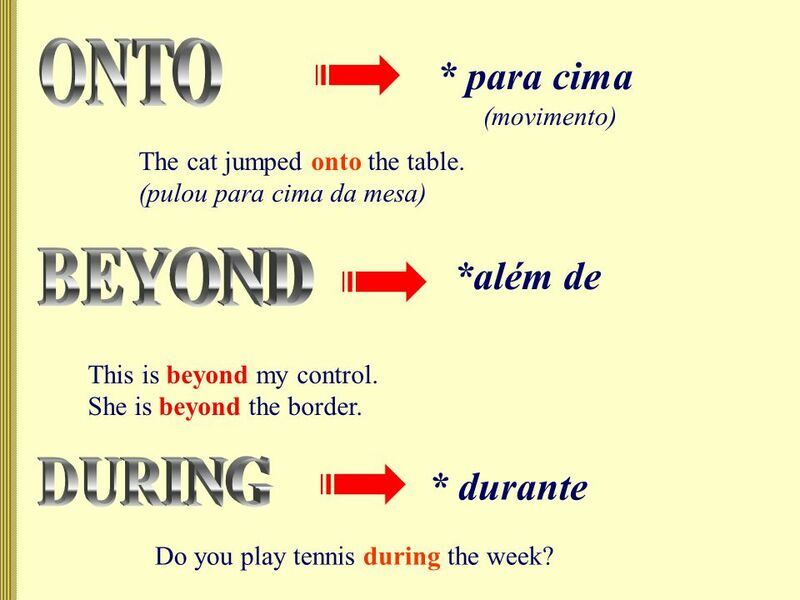 Movement Prepositions used with verbs of motion (come, go, run, etc) show the direction of the movement. Jack ran out of the room. Sue moved. 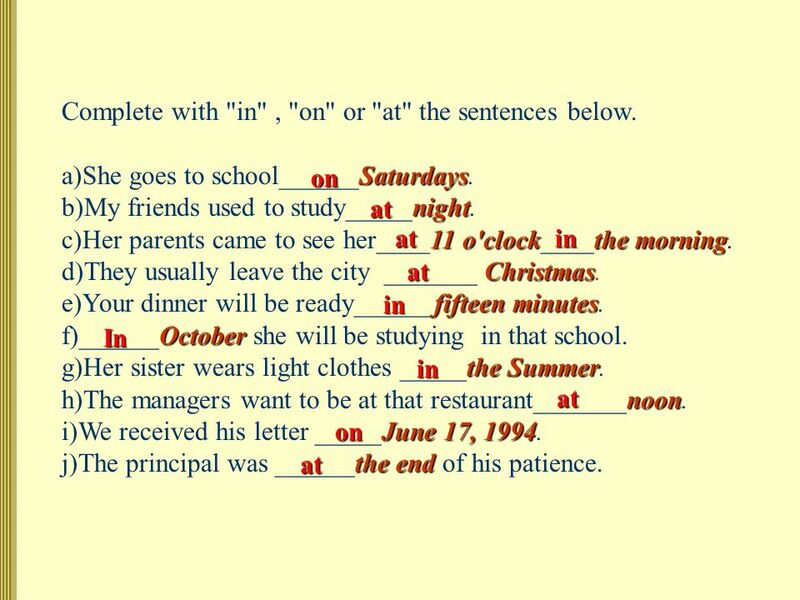 Past Tense Verbs Irregular Negative Yes/No Questions. By- Mandeep Walia TGT (English) GGSSS, Chhattarpur. 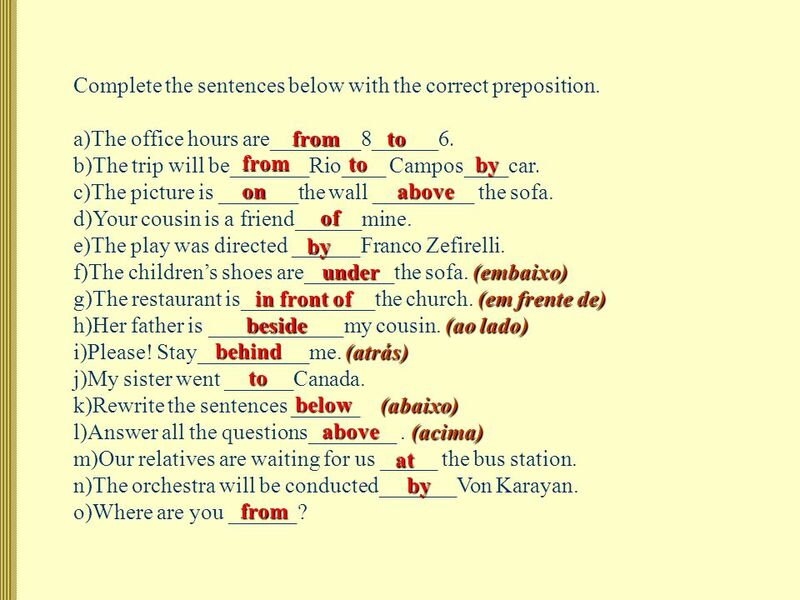 Basic Prepositions - elementary + (40 items) © Chris Snuggs24 March, 2012 Self-testing Practice - For reference and other exercises on prepositions click.